The most sublime mist we’ve come across in a long time, this is crafted from only the highest-grade organic rose floral water. Perfectly pure, this formula is soothing, regenerating and pH-balancing, keeping your complexion calm and collected while imparting the most gorgeous, dewy glow. Naturally fragrant, it’s a pleasure to use after cleansing, over make up or throughout the day – whenever you need a nourishing lift or moment of peace. Vegan-friendly and encased in chic, eco-friendly packaging, rå oils achieves the perfect Nordic aesthetic – and delivers the results to match. 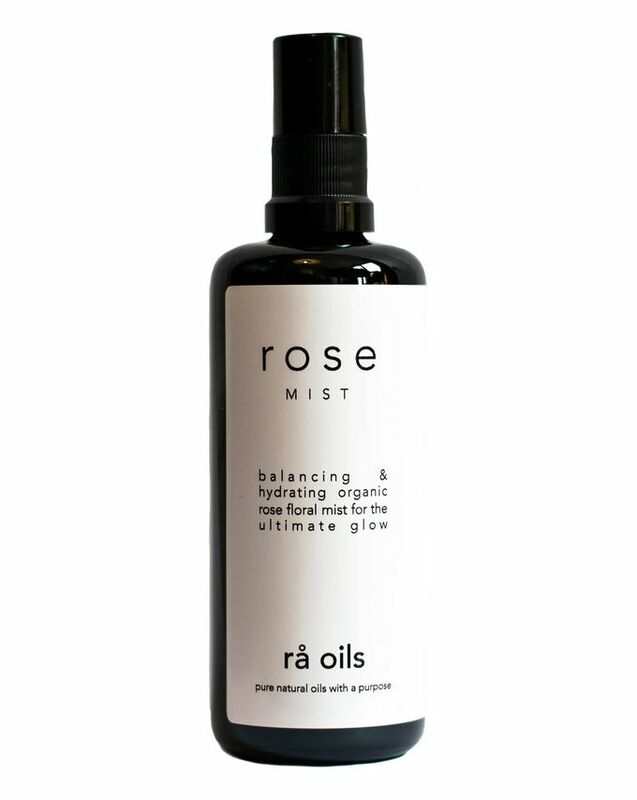 Crafted from only the highest-grade organic rose floral water, rå oils’ Rose Mist is a miracle for your complexion. The rose water included is derived by distilling the finest Bulgarian rosa damascena, from the Bulgarian Valley of Roses. Gentle, soothing and regenerating, the formula levels out your skin’s pH, bringing your complexion back into perfect balance. Brimming with vitamins A, B1, B2, B6, C and E, the mist does much more than refreshing skin and imparting a gorgeous glow (though it does these very well indeed!) it also reduces redness and inflammation, stimulating regeneration and promoting elasticity. Perfect after cleansing, this beautifully fine, naturally fragrant mist can also be used over make up or throughout the day to uplift and refresh. This can be used on both clean skin and over make up. Spray a fine mist over skin and leave to absorb. Ra Oils' rose floral water is 100% pure. Although this product has a shelf life of 24 months we recommend you use it within 12 months of purchase. I have used many products that others have claimed to smell bad but have always emerged unscathed. This was not the case with this mist. I bought this in an attempt to replace my Allies of Skin mist and thoroughly regretted that decision. The smell is just so overpowering and that I cannot bring myself to recommend this to anyone. I used this twice to try to give it a fighting chance but it was in vain cause my skin did not feel moisturised or glowy. I'm not even going to be giving my bottle to anyone cause I don't want to put anyone else through the same torture. My Skin feels soothed and fresh after using this and also gives a nice glow. Love it! I use it after cleansing and before serum/moisturiser.